I swear someone is stealing days from the months…I can’t believe it’s time for another Component of the Month design challenge reveal already! 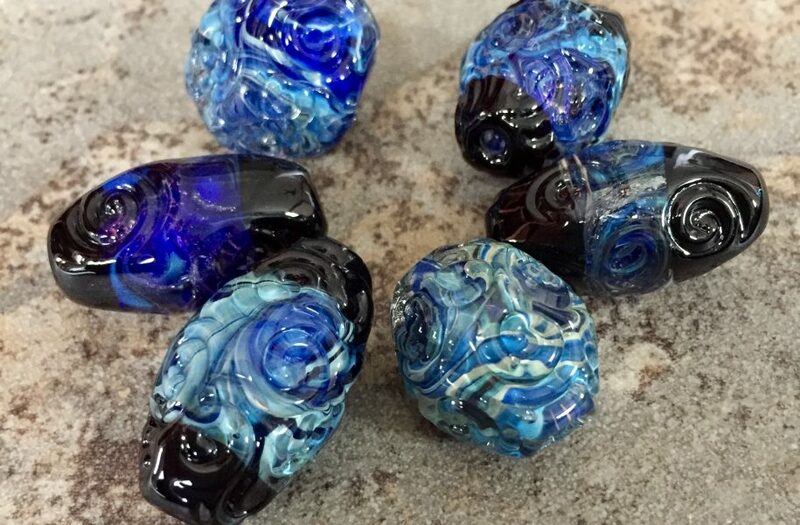 But it is and the pretties we were give to play with this month come in the form of these gorgeous lampwork focals by Jen Cameron. True to form I forgot to photograph my particular bead but it looks similar to the one back left in this image. I tossed around a few ideas and kept coming back to keeping it fairly simple because the bead really should carry the piece. In the end I decided to go with a choker length necklace with an ocean themed stacked pendant inspired by the whirls and colours in Jen’s bead. The silver element is actually a clasp I’ve had for ever and never used because I didn’t want to let it go but it reminds me of a fish swimming through breakers so it seemed like a natural match. I wrapped some seed beads around the connection trying the give the impression of sea foam and finished off with some watery droplets at the bottom. 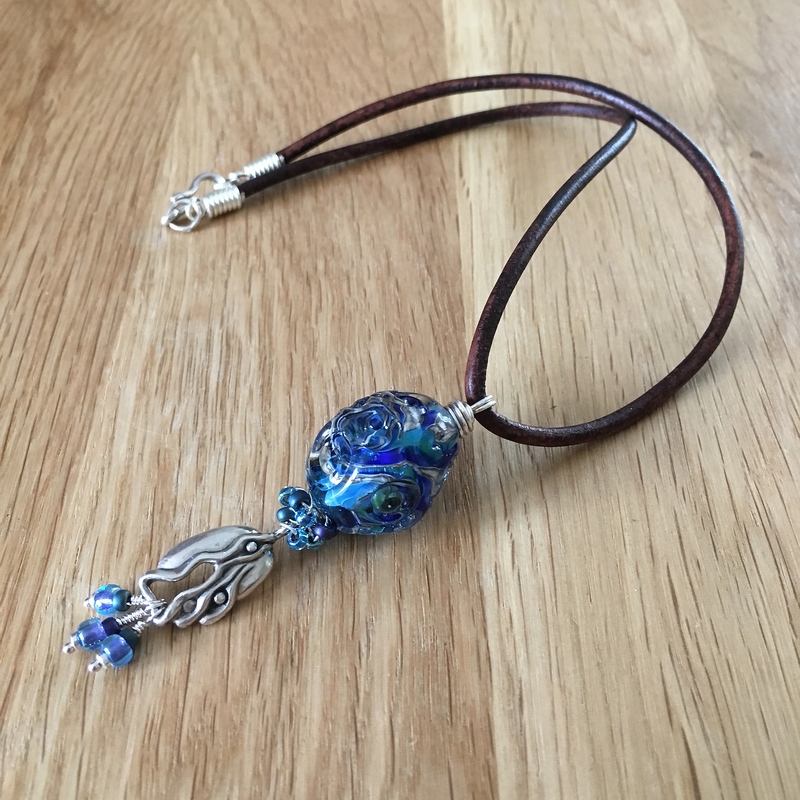 I wanted the choker element to be reasonably substantial so I used a 3mm antiqued leather cord with handmade closures and the hook part of the clasp. As I said, pretty simple but I think it has a good flow to it and shows the bead off nicely. Many thanks to Jen for providing such a lovely piece to work with,I hope you like it too. If you would like to see what the rest of the Art elements team and our guest designers have made just click on the links below to join out blog hop. Next Art Elements – Component of the Month May Reveal. The focal has the flow of the mighty ocean – this design worked really well! What a lovely design-simple but very effective in highlighting the focal bead. And I love the clever use of that clasp! Brilliant! Beautiful Lesley, I love the clasp, it goes so well! How clever to use the clasp like that! I also adore the knot of beads at the base of the focal. I agree about keeping it simple! That’s gorgeous! The ‘fish’ is perfect and I love the rich leather cord, it really shows off the whole design! Lovely necklace, Lesley! I really love the wire wrapped beads you did at the bottom of Jen’s bead. And I never in a million years would have guessed that you used a clasp as part of your dangle! Stunning. I love this. Really evokes flowing water. Clasp as dangle – inventive. It reads pearl in oyster folds to me. or tentacled creature – also in keeping with the oceanic theme. Really cool – Summer is coming! I really love your necklace Lesley, and your photo’s are just beautiful you capture the colours perfectly! The clasp elements reminds of a jelly fish! Beautiful! The silver elements looks like it was made for the bead!